Tough times, often arrive when we do not have any backup plan. Such situations, sometimes, teaches a lot and prepares us for the next time. But is it compulsory to learn from the mistakes? Accidents are meant to happen and if they don’t, the natural life-cycle will receive a solid fluctuation its graph. Jokes apart, its mandatory to keep your vehicle updated for every ride with regular maintenance and check-up. Note that here we’ll be discussing the safety issues regarding motorbikes. The new generation motorbikes are getting the options of ABS. If possible, one should always prefer such bikes for themselves. I personally have experienced that the ABS is a great function to have in your car or bike. It is very beneficial during high speeds. It allows one to control the vehicle within those crucial moments. 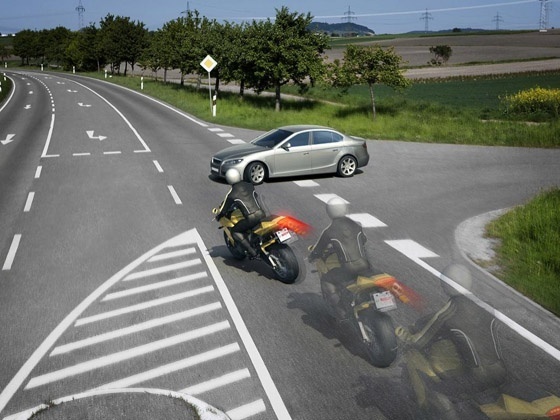 Non-ABS version of bikes does not offer such braking potential and creates a scene of panic which is very dangerous. Here, it is important to know, what ABS does. ABS or Anti Lock Braking System is a safety program which helps to cut the vehicle’s potential on application of brakes. The ABS applies the brakes in pad by pad order. When the driver applies brake at high speeds, the wheels get jammed and vehicle tend to follow the line of motion. This is because of the potential which it has got from the speed. ABS helps in cutting this potential by applying, releasing and again applying the brakes, which gives the opportunity to either change the direction or stopping the bike within very less amount of time. So, what can be done to recover such situations when you know that you will face the accident due to the vehicle’s slipping potential? Well, you either need to change the vehicle or your habit. During city driving, try to keep the vehicle under the safe limits. Always apply brakes in pad by pad manner. 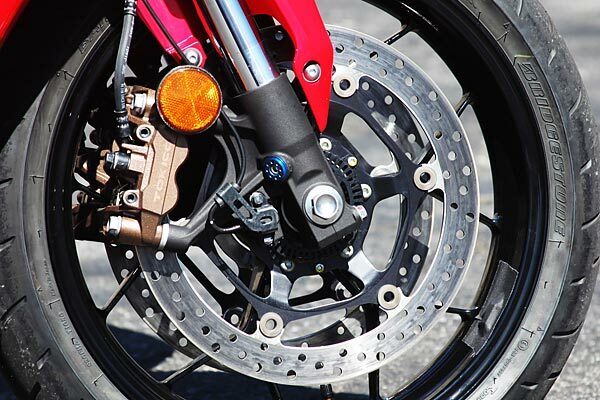 Do not keep the brake lever pressed for more than 2 seconds while applying brakes. It’s not mandatory to focus on vehicle’s speed here, it would be a practice which will help you in bad times. Pad by pad mechanism will work as ABS, but don’t take it as granted that the vehicle will work exactly to it as this depends upon the driver’s practice. Regular practice will make you habitual to apply brakes in this particular fashion. This will help you on muddy as well as wet roads. The chances of getting slipped get minimum with this technique. 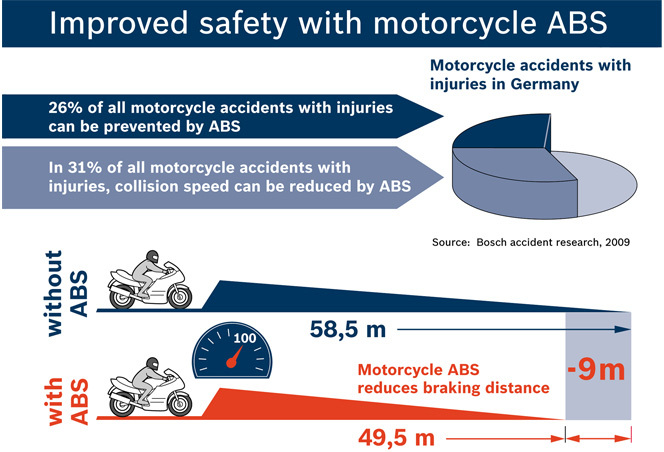 In a survey, it has been found that 26 percent of all motorcycle accidents including injuries can be prevented via ABS. Furthermore, it depicts that 31 percent of the fatal crashes can be lessen down if your vehicle is equipped with ABS than for the models without it. The collision speed can be reduced. No matter how well you ride your motorcycle on the roads, you can not foresee when the rider leading you stops his bike abruptly, forcing you to put your brakes so hard. Looking over the worst conditions of Indian terrains, you can’t predict how slippery or sandy the way ahead. The dynamic antilocks automatically reduce the pressure of brake when a lockup is coming henceforth and it gets increased again after traction put back. There is no meaning to risk your life. The graph of motorcycle crashes has been enhancing day by day. Do realize that life is the most precious thing god has given us. It makes sense to include ABS and minimize risk. Recommended: ABS or Non ABS Cars: What Difference Does it Make?